If the goal is to make Downtown Chapel Hill a vibrant, diverse, welcoming, and pedestrian friendly environment with a mix of retail, office, residential, medical, educational, religious, research, entertainment and arts-oriented uses, the following development incentives must be in place. Recognizing that the cost of these incentives vary, it is nonetheless imperative that the Town dedicate the resources necessary to achieve them. The University of North Carolina is a world class institution. It deserves and demands a world class downtown as its front door. Downtown must be, and be perceived by citizens, as clean and safe. The Downtown Partnership, as downtown’s managing entity, should hire a private company to contract for clean and safe services. These services must include a team of trained professional ambassadors who patrol downtown 18 hours a day, seven days a week. 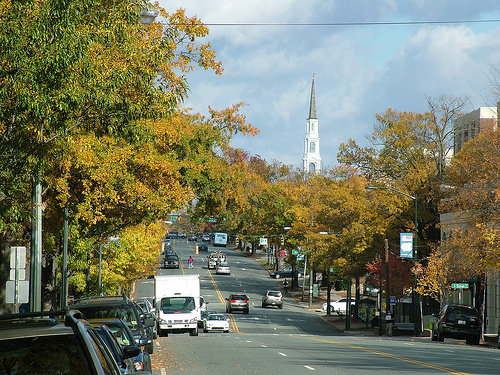 The Downtown Ambassadors would provide custodial, security ( as an adjunct to the Chapel Hill Police Department ), visitor orientation, and social outreach services as a minimum. The cost is between $330,000 and $350,000 annually. This amount would cover all equipment, uniform, supervisory, payroll, retirement, and administrative costs. Provide that the following uses be uses-by-right in downtown, and as such require no additional approvals from the town other than building permits, zoning compliance, and certificates of occupancy. Establish a three tiered system of permitting new construction or rehabilitation, as noted above, as follows. 0-25,000 square feet- staff level review and approval only with a 60 day ( 2 month) guaranteed review period. 25,001-80,000 square feet- staff and Board and Commission level review and approval only with a 120 day ( 4 month ) guaranteed review period. 80,001 square feet and above- staff level, Board and Commission level, and Town Council approval with a 240 day ( 8 month ) guaranteed review period. Denials of permits at the staff level and/or Boards and Commission level may be appealed within 60 days of the denial to an Appeals committee. That Committee shall be comprised of the Mayor, Town Manager, and the Town’s Economic Development Officer and shall rule on that appeal within 60 days of its filing. Denials by the Appeals Committee may be appealed to the Town Council within 60 days of the Appeals Committee denial. Create an expedited approval process for any other Town required permits for Downtown businesses of 90 days or less. Adopt the following development principles as contained in the Downtown Development Framework and Action Plan, and adopt the specific projects as part of the Town’s Capital Improvement Plan. Create new north-south and east-west streets in Downtown, as called for in the Plan. Within the Cameron-McCauly and Northside neighborhoods only those new streets approved by the respective neighborhood associations would be created. New streets should avoid destroying existing businesses and owner occupied housing. The new streets should be designed as called for in the Plan to include landscaping, green space, and streetscaping elements. Future parking deck sites as identified in the Plan should be acquired and used as surface lots until the Town can build the decks. The new decks should be financed so as not to cause the price for hourly, daily or monthly parking to be over 80% of existing market prices for public parking. Research whether a transit transfer station can be developed on the new north-south street called for between Church and Columbia. Research the advisability of moving from a use-based zoning code to a form-based code, at least for Downtown. This will have positive benefits for Downtown by giving the development community a clearer understanding of the design standards for development and allows for easier Town review of mixed-use projects. Regional mass transit should be available and centered in Downtown Chapel Hill, should Orange County voters approve the transit tax. The bus/light rail system will encourage density and a mixture of uses and should include direct links with, or easy connections to, the UNC Medical Complex. Resolve the conflicts that currently exist between the Zoning Code/ Land Use Management Ordinance and the Northside and Cameron-McCauley Historic Districts with respect to overlapping physical boundaries and incompatible development requirements. The Town should utilize Tax Increment Financing ( TIF ) or what is known as synthetic TIF to finance the acquisition of recommended properties and construction of capital improvements called for above, to the extent allowed by the North Carolina Statutes. I do not support for this. It suggests that current custodial and safety services provided by the Town are inadequate. If this is the case, it should be addressed rather than bringing in a private firm to do what the Town is supposed to be doing. Next, what “downtown” area is being addressed by this initiative? Finally, how does the Downtown Partnerships suggest that this will be paid for? With respect to the long list of uses that would qualify as uses-by-right in downtown, and as such require no additional approvals from the town other than building permits, zoning compliance, and certificates of occupancy, I do support that all of these “uses” could be progressed “downtown” without input and oversight from the Town and the various Committees. I understand that developers and business owners may have frustrations with the current approval process, and I think some of the other suggestions could be considered. I think it is very helpful to put specific suggestions on the table and I appreciate the opportunity to comment.